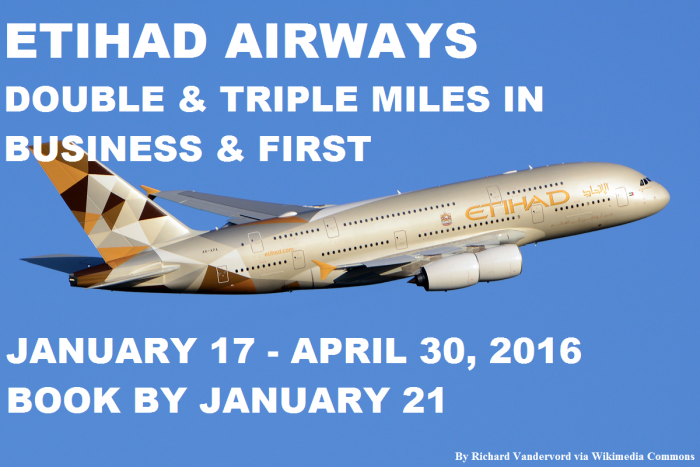 Etihad Airways has launched new double & triple Guest miles offer for business & first class. The offer is valid for flights between January 17 – April 30, 2016, that are booked by January 21. I am still waiting for one of the offers that Etihad Airways had last year for both bonus award and tier miles. Then I am ready to make some flight purchases. This is good offer nevertheless. Although this registration method is “unique”, at least you get a confirmation for the promo registration. This offer is open to Etihad Guest members only. This offer is only applicable for travel in First and Business Class. Registration is mandatory to receive the bonus miles and is valid till 21 January 2016. This offer is valid for travel between 17 January until 30 April 2016. Bonus Miles earned will be Etihad Guest Miles and not tier miles. No bonus miles will be credited to the member, if registration has not been done. This promotion cannot be used in conjunction with any other promotion from Etihad Airways, Etihad Guest or Etihad Airways Partner airlines. Bonus miles will be credited one month after each flight. No bonus tier segments will be credited. Each member must register separately to be eligible for the offer.